Some twenty-five years ago, Congress designated the month of May as National Military Appreciation month. It's not a particularly well-known fact, even though there are a number of military holidays included in the month of May. And why, you may ask, is an entire month set aside for honoring our military? Quite simply, it takes that long to really run the gamut of what "military" means to this country. Military is past; it is present; it is future. It touches our lives every day in ways that do not even occur to us unless we actually take the time to sit and consider them. Our Fallen. There is a price for freedom, and it is a steep one. As a nation, we've lost fathers, mothers, siblings and dear friends. The thought of the legions who have given their lives to preserve our American way of life is staggering. The sacrifice is worth remembering every day, but special time is set aside for this very task on Memorial Day. Our Veterans. May is the month of VE Day, and especially this year as we celebrate its 70th anniversary, it's easy to remember the many lives put on the line so many years ago. But let's not forget the millions of veterans living in this country, with more leaving the service every day. They face some unique challenges, but they also come with the kind of skill and leadership that is not just taught, it's forged. Our Service Members. May is also the month of Armed Forces Day, honoring the men and women serving in all branches of our military. On the every day, it's easy to forget that tens of thousands of men and women are still serving in hostile territories today, or that even more stand waiting to be called with any threat that comes our way. In fact, their very work is precisely why we can sometimes forget how hard-won our safety and security are. May is a month not to let the price of that security slip our minds. Our Spouses. 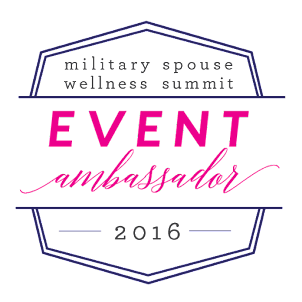 Often referred to as the "Silent Ranks" or the "Force Behind the Force," military spouses are anything but. They are vocal advocates for our military and their own families. They sustain the homefront while their service members are at war--raising children, caring for parents, maintaining household and sanity at the same time (which can be no small feat!). They care for their own families while their spouses are working to protect everyone's. They are the force beside the force, which is why the first Friday of every May is designated Military Spouse Appreciation Day. Our Future. Being the mom of a five-year-old who has been an Army brat his entire life, I can tell you unequivocally that milkids serve too. 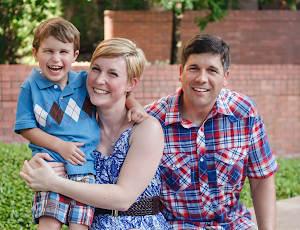 When a service member commits to our military, the entire family serves. And military life can take a toll, straining marriages, relationships with kids, even the ability to start a family in the first place is made harder by military service sometimes. In a month where we honor families, mothers, teachers--let's not forget those families dealing with the many challenges of live and the many challenges of war on top of them. I think perhaps the most critical thing in May--besides not saying "Happy Memorial Day"--is remembering that the month continues to have significance. Because our military, their families, our veterans, they are all sacrificing now. Today. Whether giving up time together, dealing with the strain and challenges of military life, or dealing with the wounds dealt to them by war, the sacrifices are continuous. That's why I'm incredibly proud to be working with Chevrolet as part of its Chevy Salutes campaign. Chevy's programs really span the entire gamut of what it is to be "military." From workforce development programs like "Shifting Gears" and work through Hiring Our Heroes Fairs, to product discounts for military, veterans, and their families, to support of numerous non-profits working for veterans and military families, Chevy takes seriously its commitment to honor our heroes. 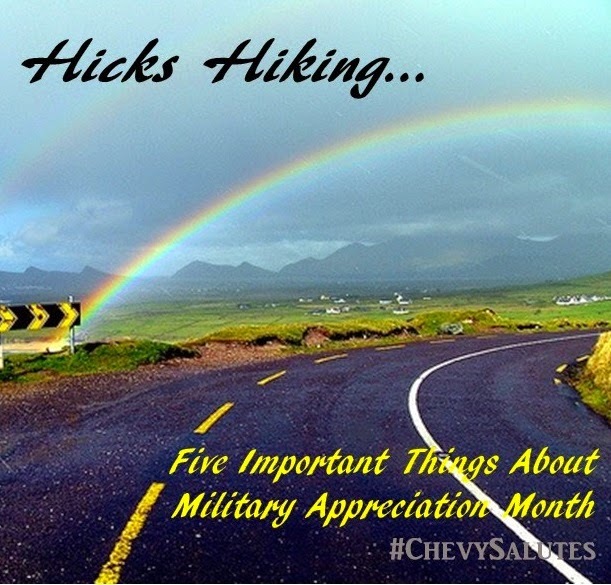 And for military families in the month of May, Chevy is going the extra mile (see what I did there?). 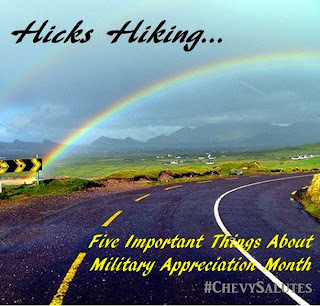 For anyone looking to "find new roads" in a new set of wheels, the Chevrolet Military Program has you covered, with the best discount program of any car company. 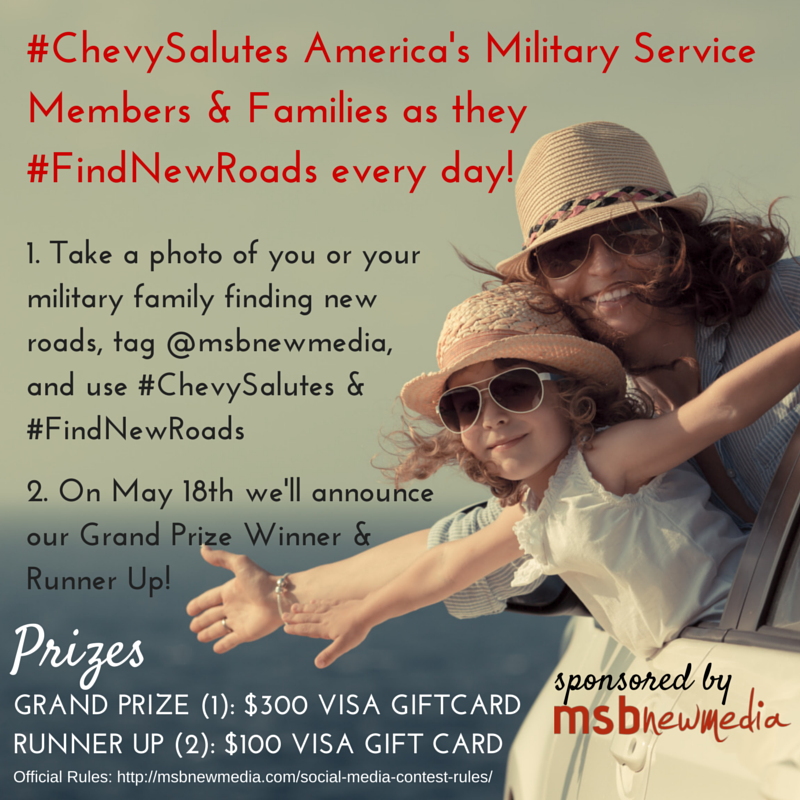 Now through May 17th, post pictures or video to Instagram (don't forget to use hashtags #ChevySalutes and #FindNewRoads). Participants have a chance to win one of three awesome cash prizes! Check out the official rules here. How will you find new roads?